*Note:* The instructions below may not be accurate for all current Apple devices. 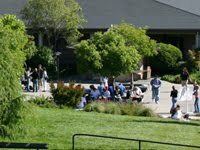 *Note:* to configure Google Calendars on your phone requires you to be on campus, because part of the process involves logging into the Active Directory password system (which must be done from a networked computer on campus). 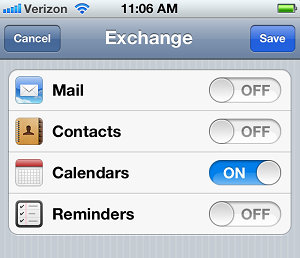 Navigate to "Settings", then click on "Mail, Contact, Calendars". For "Email", type your Cabrillo email address, making sure to include the "@cabrillo.edu" part. For username, enter your Cabrillo username, which should be the same as your email (minus the '@cabrillo.edu part). Enter your Cabrillo account password. We recommend changing the description to "Cabrillo Google". Once you hit "Next", the "Server" area will appear. Enter "m.google.com" in the new server field. After you hit save, a box will pop up saying "Password Incorrect" - do not be alarmed! This is normal. and go through the process of verifying your password by re-entering it into the 'password' field. Once this step is complete, navigate back to the settings for Google Calendar, and reenter the password. Active Directory will now have verified the security of the Google Calendar as accessed from your phone, and the phone settings should now accept your password. However, as mentioned above, it can take some time - you're phone will work fine during this time, just give it a bit before the calendar becomes synced. And that's that! Please contact the Help Desk is you have any issues. The AddPass process no longer exists, please Contact Help Desk if you experience any issues setting up your Calendar.